Struggling to get your business to rank high in local search results? Every smart marketer knows that local SEO is the next big thing in digital marketing. The higher you rank in local search, the better your chances of attracting relevant customers to your business. So if you’re ranking low in local search, it’s a huge problem. Whether it’s for local SEO or regular SEO, keywords still play a major role in content marketing. Keywords will become the foundation for your content. So you’ll need to start by conducting thorough research on local keywords for your brand to target. Remember that the keywords need to be relevant to your business, and relevant to the city/neighborhood you’re targeting. Then enter that keyword into the Keyword Planner to get ideas for high-ranking, local keywords relevant to your service and location. The tool will generate several ideas for local keywords, as shown in the screenshot below. 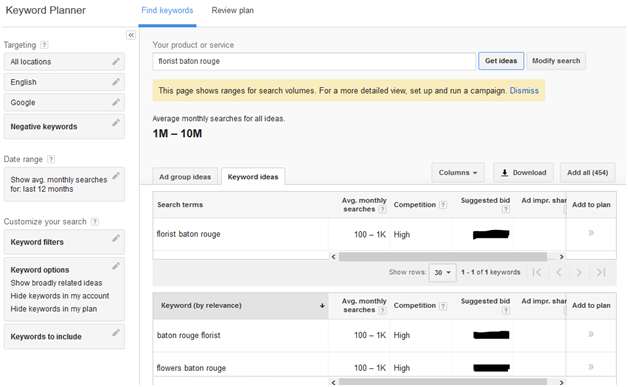 The Keyword Planner automatically lists the keywords based on their relevance to the original keyword you entered. You can also sort the results based on the number of average monthly searches, or the level of competition. Next, make a list of the best keywords, which are those that have high average monthly searches, and low competition. Make sure all keywords on your list are still relevant to your business, and the location(s) you’re targeting. This list will then form the foundation of your content ideas and topics. Using the list of keywords you generated, start brainstorming ideas for keyword-optimized content. Your best bet is to create local content, such as local guides and lists. These types of content are relevant to the area you’re targeting, and can be created to suit your niche. You can incorporate the target keywords from your list into the content as you’re writing it. This type of content is crucial, especially if you’re selling products or services that require permits. Different states, cities, and even communities have different regulations for certain products and services. To improve your local search rank, develop content to help customers navigate those local regulations. For example, if you own a garbage disposal service, you could provide readers with useful tips regarding disposal regulations for certain types of trash. Or if you sell furniture, you could guide readers through the process of recycling their old furniture, according to state/city/community regulations. 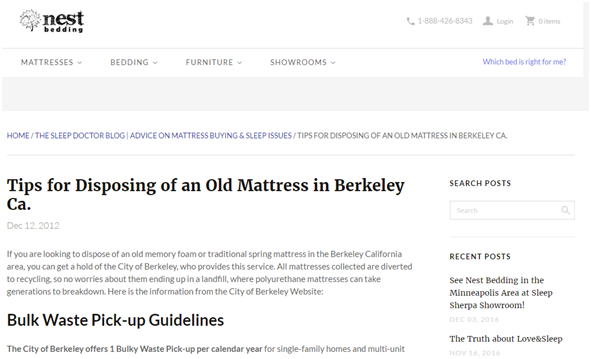 Nest Bedding, for example, created a guide for how to dispose of old mattresses in Berkeley, California, and published it on their blog. Although the post isn’t exceptional, or keyword optimized, it should help give you some ideas about the types of location-specific guides you can create for your business. Promote local businesses that are related to your own business by creating a “Top 10” list, or “Best of” list. Write about local businesses that provide services, or sell products that are similar to your own, but not in direct competition with you. This gives you a chance to create useful content for readers in your target location, while making the most of the high-ranking local keywords you’ve compiled. Let’s say you’re a wedding planner, and you’re trying to target people who are planning a wedding in a specific location, like Grand Rapids, Michigan. You could compile a list of your favorite caterers, wedding photographers, bakers, florists, etc. in Grand Rapids. Or, if you provide any of those services, (catering, photography, baking, floral arrangement), you could create a list of businesses that provide other wedding-related services in the area. 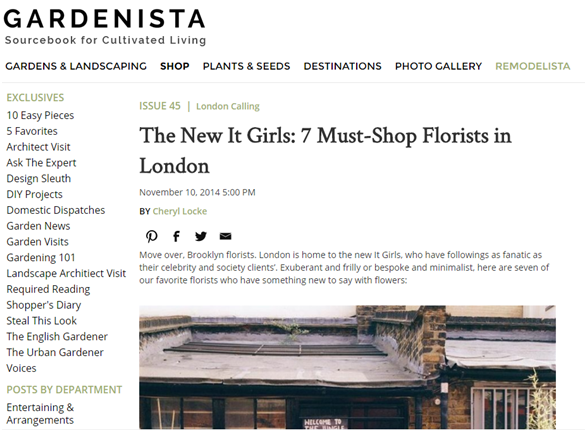 Gardenista, an online gardening resource, for example, published a list of the top florists in London. This is an excellent way to boost your local SEO through keyword-optimized content, while promoting local businesses relevant to your niche. Climate and customs can vary a lot from place to place, even within the same country, province, or state. Because of the differences in seasons, celebrations, and events, people in specific locations experience unique challenges, and have particular needs. To improve your local search rank, create content geared towards solving the specific needs and challenges of the people in your target location(s). For example, winters in Minnesota are amongst the harshest in the country. So if you’re targeting people from Minnesota, you could provide tips and guides to help them get through the brutal winters. Let’s say you’re a car servicing company based in Minnesota. You could create content to help people prepare their cars for the freezing temperatures. 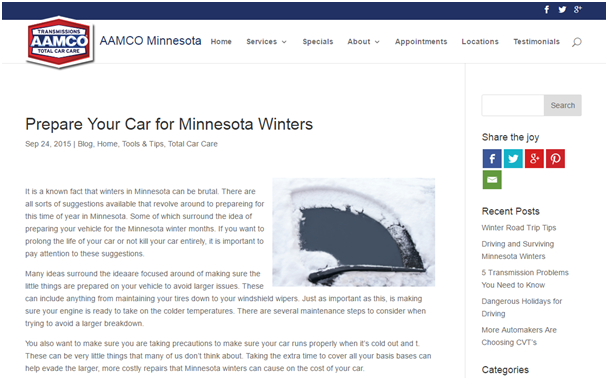 That is exactly what AAMCO Minnesota did in one of their blog posts, as you can see below. You could even take it a step further, and produce an entire series of tips for winterizing cars. For instance, you could write about engine maintenance in one post, and follow it up with windshield maintenance. To improve your local search ranking for a specific location, your goal should be to associate your business or brand name with that location whenever possible. One way to do so is to get involved in the local community. You could support local causes or charities, which will not only benefit a good cause, but also help you build a positive brand reputation. If a local newspaper or magazine covers the story, you could get them to link to your site. Better yet, they may already link to your website without you having to ask. High-quality links from reputable local publications can help improve your local search ranking, and drive relevant traffic to your site. Below, let’s take a look at an example from Shore News Today, a publication which focuses on news in New Jersey. 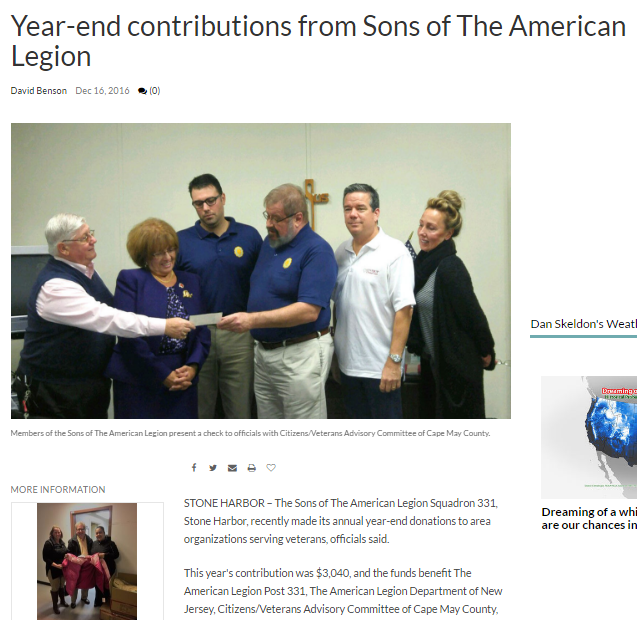 They recently published a story about the local chapter of the Sons of the American Legion making its annual charity donation. This is an excellent example of local links. At the end of the story, the publication added a link to the website for the veteran organization’s post in Stone Harbor, New Jersey, (shown in the screenshot below). Now you’ve learned how to use content marketing to improve your local search ranking. In addition to the tips above, you can also reach out to local blogs and websites and ask if you can write a guest post. Guest posting for local publications can help you earn high-quality local links, and improve your ranking in local search results. Which of these ideas have you tried before? And which one of them are you planning to try next? Share your thoughts in the comments below. And if you need any personal assistance to improve your local ranking, don’t hesitate to get in touch with me. I can help you pull off a sensational content marketing campaign that is in tune with your local SEO goals. As one can see from the snapshot in the article, you cannot get the exact number of Average Monthly Searches unless you have an ongoing AdWords campaign. I suggest creating a campaign with a small budget to be able to get exact average monthly searches. 1-100, 100-1000, and 1000-10,000 is not a good indicator of which KWs are getting the highest number of average monthly searches. With a paid campaign one can see exact no. of searches, which is crucial to select the correct KWs to target. Writing a quality content is the toughest part of digital marketing, in the 2nd point of your article has nicely described in simple and effective way, how to write a quality content? Content is the king of any blog or website and your post is best tutorial about content too. Awesome work done by you about content marketing and how to use keywords in an content. Really helpful for new blogger. Thanks for sharing this precious information with us. Hey Shane, very nice article! Every content marketing strategy begins with these two core tasks. First an in depth keyword research and next is generating a quality content that is relevant to your niche and appealing to your audience. But when it comes to local search rankings, along with content marketing, local business listing is the next big thing that can get you instant visibility and a great deal of lead conversions. I have made local listings and results are really overwhelming. This is a good article, it definatly presents new ideas for me when it comes to local marketing. Such as being active in your community, reaching out to other local websites to make comments, and even using googles keyword planner for more ideas. Thanks! In working with individuals and business owners, I always encorage them to further build their brand with a blog, as it increases their social currency.